I read this article and found it very interesting, thought it might be something for you. 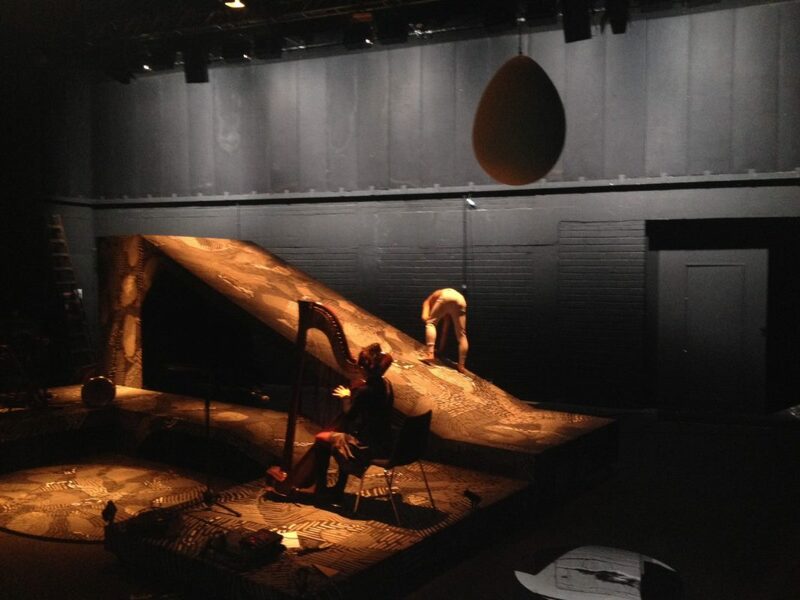 The article is called Theatre Review: Visitant @ Project Arts Centre and is located at https://www.totallydublin.ie/theatre/theatre-review-visitant-project-arts-centre/. As the audience files into the space upstairs at Project, a contorted, ghostly figure atop a large structure can be made out on the dimly-lit stage. Two sinister, hooded shapes appear engaged in an eskimo kiss on the floor below, while sibilant rainfall patters in the ether. A collaboration between visual artist Alice Maher, composer Trevor Knight and Butoh dancer Gyohei Zaitsu, Visitant is dense with images and sound. The set, or ‘visual setting’ as the programme has it, is a monochromatic, surreal-scape featuring various oddments that only become apparent intermittently under the shifting focus of Marcus Costello’s lighting design. The centrepiece is a bulky metal ramp daubed with a swirling pattern, the site of dancer Zaitsu’s painstaking fall from grace over the course of the performance. The work takes as its starting point Gabriel García Márquez’ ‘A Very Old Man with Enormous Wings’ (from Leaf Storm), the tale of a castaway angel/decrepit elderly gent washed up on a shore, discovered by an old farming couple and subsequently exploited as a spectacle to raise a small fortune. In Visitant, Zaitsu’s Butoh angel is a feat of grotesquery, a bone-white figure with strealing, tattered wings and sinewy, taut limbs, who moves at achingly slow pace, his expression reeling between deranged grimaces and fatuous grinning. It’s in keeping with the (open-ended) surrealist form of Butoh dance, which prizes the anachronistic and the absurd. In Márquez’ original tale, the true identity of the angelic/elderly visitor is never revealed and Butoh affords a rich resource for Zaitsu’s interpretation of this shadowy figure. There is something simultaneously decadent and perverse in his gurning, writhing figure as he begins his descent from the top of the ramp to the stage below. He ends in abject grovelling, a study in dissipation. Knight himself and harpist Áine O’Dwyer are the gothic minstrels to Zaitsu’s gradual descent from the heavens, the former on keyboards and various esoteric instruments, while O’Dwyer provides a sinuous turn on the harp, grappling with the instrument more than simply playing it. Zaitsu’s movement is largely improvised in response to the soundscape created by his co-performers. Knight and O’Dwyer’s sounds range from the grandiose and macabre to a lilting, vaudeville ditty that soundtracks Zaitsu scrabbling about in a scruff of gold coins, earlier tossed on his sprawling form by Knight. This tossing gesture, one of the actions that aim to align the musical and movement components of the piece, has an awkward, overly theatrical feel to it. The same is true of several such contact points in the performance, where the movement of the musicians is somewhat stilted and gauche, jarring next to Zaitsu’s stillness and control. This inconsistency of tone infuses Visitant with a naïvety that undermines the experience and acumen of the three performers. A more successful collaboration, Maher’s set and Costello’s lighting design sing together, the latter illuminating the former in ever-surprising ways at key moments. At different points, a Dali-esque egg depending from the ceiling and a gelatinous floor disc that acts as a mirror for Zaitsu, are revealed. The piece closes with Zaitsu recovered from his lowly grovelling and restored to upright dignity, exiting the stage in a series of still moments; it’s one of the most effective images of the show. Somewhat turgid on the whole, Visitant’s strength lies in the visual impact it creates in such moments of stillness, when the cacophony of abilities behind the making of the work resolves into quietude.